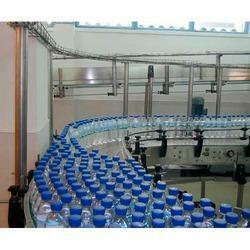 Prominent & Leading Manufacturer from Coimbatore, we offer bottle conveyors. Our company has earned accolades in offering Bottle Conveyors to the clients. These products come in compact designs and with low conveyor section height are also easy to integrate into the process line. Offered range can be available in different finish configuration choices so as to match up with the specific usage demands of the customers. Bottle Conveyors are rigorously tested by the quality controllers on various parameters. These products are produced and made by making use of utmost quality components. The offered range is widely used by the esteemed clients for characteristics like approved quality and long working life.